The Flyer II was the second powered aircraft built by Wilbur and Orville Wright, in 1904. 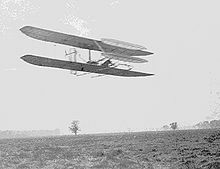 The design of the Flyer II was very similar to the original 1903 Flyer, but with a slightly more powerful engine and construction using white pine instead of the spruce they used in the 1903 machine as well as the gliders of 1900-1902. An important change was reducing the wing camber to 1-in-25 from the 1-in-20 used in 1903. The brothers felt that less camber would reduce drag though less lift was actually achieved. With these alterations Flyer II was heavier by some 200 pounds than the 1903 machine. The Wrights tested the new aircraft at Huffman Prairie, a field outside of Dayton, Ohio, which is now part of Dayton Aviation Heritage National Historical Park and also part of the present-day Wright-Patterson Air Force Base. They flew the 1904 machine 105 times that season, ultimately achieving flights lasting five minutes. They succeeded in flying full circles on some of these flights, which Wilbur accomplished for the first time on September 20. Also by September they had enlarged the front elevator which partially remedied the Flyer's undulations and sudden darting for the ground. Likewise as of September 7 they began using a weight and derrick(catapult) to assist the Flyer on takeoff when the winds were down or had changed direction in conjunction with the position of their launching track. The Wrights disassembled the airframe of the Flyer II during the winter of 1904-05. They salvaged the propeller chain drive, its mounts, and the engine. 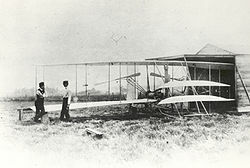 The tattered fabric, wing ribs, uprights and related wooden parts were reportedly burned (according to Orville's memory) in the early months of 1905. The salvaged propeller parts and the engine went into the new airframe of the Wright Flyer III. Picture - Wilbur in FlyerII Circling Huffman Prairie November 1904. The front elevator has been enlarged & the radiator moved to a rear strut since the May photo above. Wescott, Lynanne, Paul Degen, Wind and Sand: The Story of the Wright Brothers at Kitty Hawk. Harry N. Abrams, Inc. New York, 1983. Includes excerpts from diaries and correspondence pertaining to the Wright Brothers and their experiments.